In a pursuit of fabricating pcb’s, I have won. 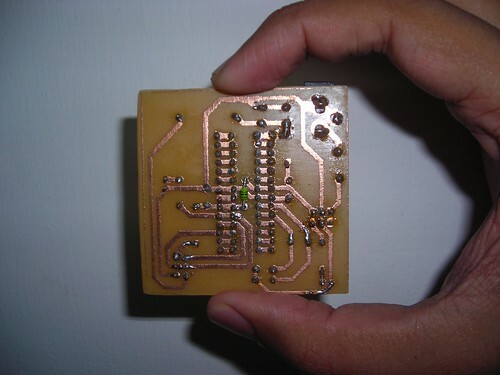 I had designed pcb’s boards using PCB. But when I tried to fabricate the pcb in my home, I used to fail. the problem was with the Acrobat Reader . When I take the print out on the paper for layout transfer to the board, a size change occurs to the layout. This size change make the layout completely useless. Actually it was the wrong option selected in Acrobat Reader that made the size change.Now it is OK. 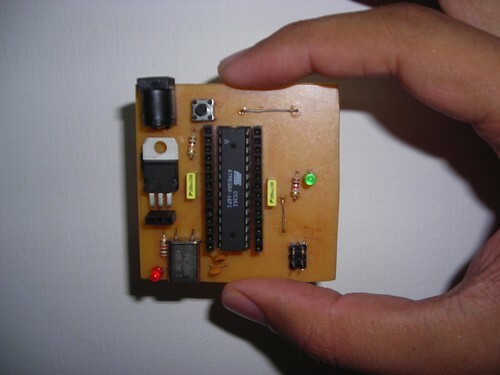 This is development board designed by me for the ATmega8 microcontroller. It is a miniature ARDUINO. You can burn your bootloader and then use with Arduino IDE or you can simply upload your hex file using DAPA programmer circuit. If anyone needs its schematic file please post an comment or I will soon upload it when I am free. Anyway this is an open hardware project. I will try to upload the details soon. If you are in a hurry, please comment so that I can upload the details fast.